Register Log In Home Forums General and Off Topic Universal Orlando Storefront - Which Movie? 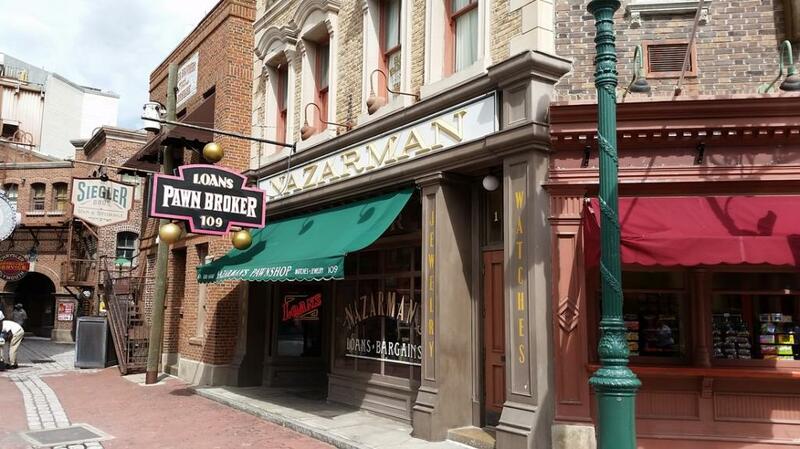 I was absolutely gobsmacked when I first saw this pawnshop storefront at a Universal park in Orlando about 6 years ago. Can you say which movie it refers to without googling it? Who played the lead? The last movie I saw in a theater was the Star Trek one with the whale. Haven�t been to one since. Last edited by PimTac; 03/16/18 11:57 AM. Well, I'm out on this one. I watch a LOT of films, but I had to look this one up, and have never even heard of the film that this is from until I looked it up. Might have to give it a watch, though, now that I know about it. I never seen the movie so I looked it up.Looks like something I might like. Is it a good movie? Worth $3.99? I checked and I can rent it on cable. Took the family to Universal last year, loved it and had a great time. I remember walking down that street but didn't take special notice of that storefront. Had to look it up - never heard of the movie. I saw the movie last night, at the end the ambulance with a banged in left rear quarter was a nice touch. Doubt you'd see something like that these days. I give it a 3 star. ok maybe I missed something here.. everyone is talking about this movie, but no one has mentioned what the name of the movie is!! come on now, no time for hidden meanings..
nevermind.. I googled the name on the awning.. lol.. wow I must be tired..
Last edited by researcher; 03/18/18 12:38 AM. I was somewhat obsessed with "The Pawnbroker" when I was in my late teens and insisted that my friends all watch it with me...they all agreed it was a great film, but extremely depressing. I thought Rod Steiger's performance as an emotionally alienated Holocaust survivor who is suddenly overwhelmed by the parallels between his old and new lives was very powerful. I think it's great that Universal decided to pay tribute to the film in their theme park, but it is still seems like such an odd choice to me as it has faded somewhat into obscurity and there was nothing "fun" about the picture at all! The holocaust was a really sad time in humanity. I don't need to use 2hrs+ of my life reliving It or interpretation through a film. No thanks to any of those films. I grew up with stories of both sides abuse (Hungarian Jew extermination while the Soviets free them from the camps , Polish /Ukrainian refugees survivors of Soviet occupation, and pro-stalin regime abuse).